Create a beautiful rib by doing it with a twist! That's the magic of the twisted rib stitch. This is a variation on the 1 x 1 rib stitch that creates a neat, gorgeous rib pattern. All stitches - both knits and purls - are worked through the back of the loop (=twisted), which results in an elegant, crisp rib. Master this stitch and make the Lucy Beanie or the Sunny Sunday Cushion! Knit one twisted knit stitch by holding the yarn behind your work. Insert the right needle into the BACK (sorry Gang for the caps, but it's super important that you do this through the back) of the next stitch, on the left needle. 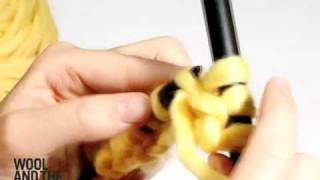 Wrap the yarn and pull it through as for a normal knit stitch. Slip the stitch off the left needle. Now purl one stitch in twisted purl. 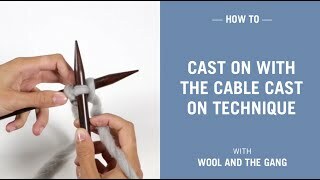 Here's how to: Hold the yarn in front of the work. Insert the right needle into the BACK of the next stitch from left to right. Wrap and pull it through as for a regular stitch. Then slip the stitch off the left needle. Still going? Good. Repeat these two stitches across the rest of your row. After a few rows, your knit should now look like the image to the left. Very pretty in other words! 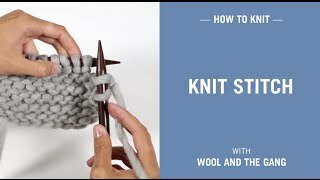 For your next row, continue to alternate between knit and purl like for a regular 1x1 rib stitch, but remember to always knit and purl using this twisted technique. This way you'll end up with a gorgeous and decorative rib. We use it in the Vivienne Cardigan, a fun project to check out!